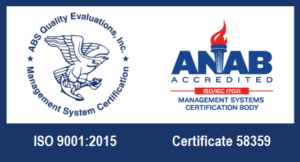 As we know through our experience that high quality regulation is mandatory for a proper heating system, we’ve been developing the most advanced regulation system for radiant heating. It is not only a question of ensuring a maximum comfort in any room at any time, but also to minimize the energy consumption to optimize the running cost savings. Moreover, our systems include the state of the art technology for an intuitive and practical use (touch screen, mobile application, …). 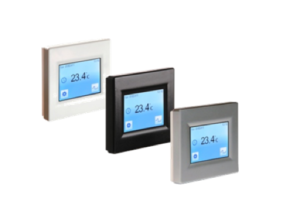 We are offering a wide range of thermostats to control heating per room, for residential houses and apartments as well as for offices, shops, school, hotels, … They are located directly within the room to be heated and control all the heating elements connected. They can be digital (programmable) or analogical, can control depending on floor or air temperature and offer a wide range of options to improve the quality of heating and consumption control. Floor temperature regulation to enjoy a tempered floor (bathrooms). 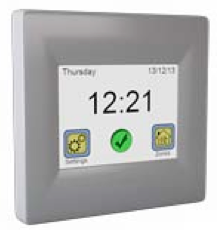 Our TFT thermostat is most successful thermostat in the sector over the last few years. 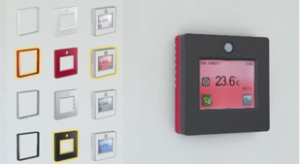 A programmable touch-screen features a large number of properties accessible via the simple interface of its touch-screen display – an easy and clear way of setting the required functions for the optimization of heating comfort and minimizing operating costs. 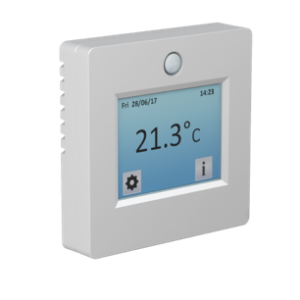 Now available in a new version with a modern looking thermostat with alternative color schemes and new functions (Menus in 16 different languages/passive infrared occupancy sensor). The visible outer part is now composed of two sections – a body frame and a front cover. 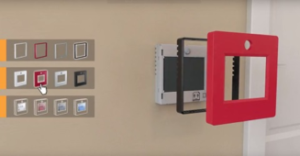 Both of these components can be detached and exchanged for one in a different color (Three colors available (black, red and silver) besides the white (from the thermostat). It is a very easy procedure and the user can do it alone – no assistance from a specialized company is necessary (see below video). 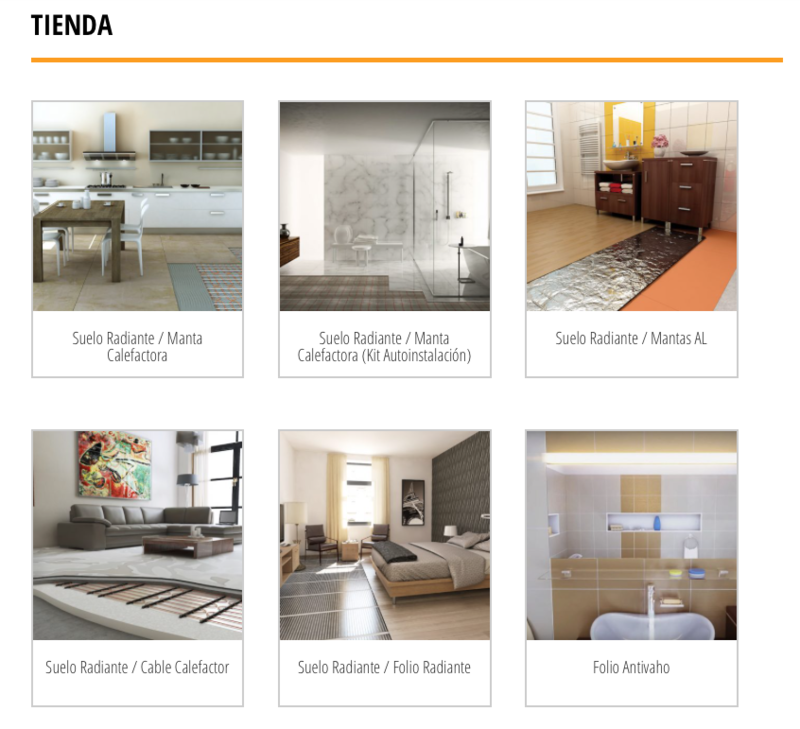 You can also check the simple application to try out which TFT color scheme would suit better your room. 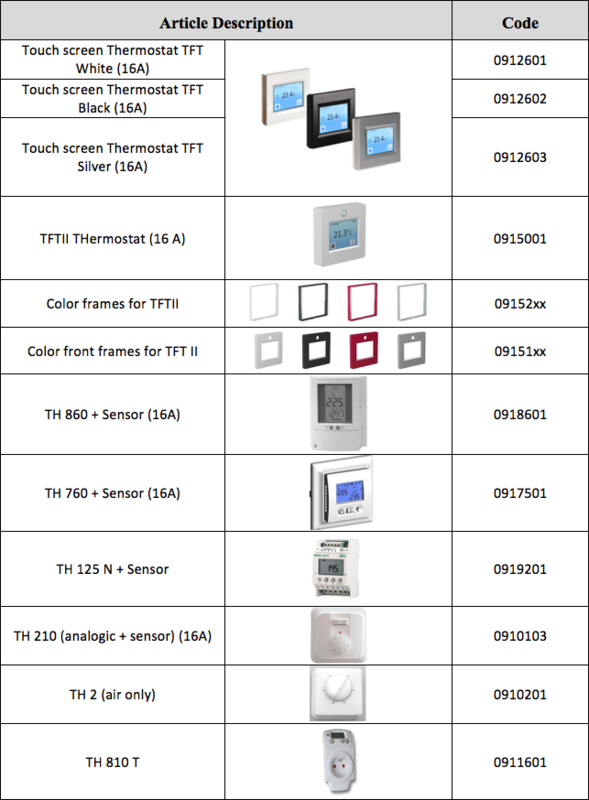 Besides, we offer a range of digital thermostats with different designs, as well as a plug-in thermostat and an analogical thermostat to suit the different needs. 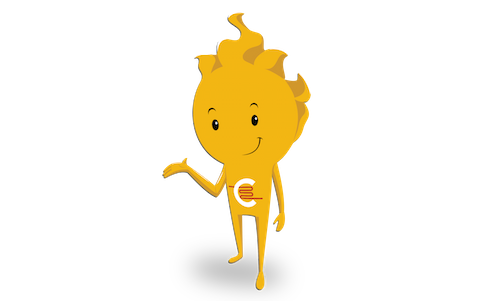 A wireless regulation consists of a system without wiring between the switch that run on/off the heating element and the thermostat that controls the temperature according to the set up programmed temperature. Communication in between the elements is performed through radio frequency. For renovation, this system is ideal to substitute an existing system or to install a programmable regulation system originally inexistent (without any need of installing additional connection lines with the corresponding extra work). It is also intended for large rooms where several heating elements are needed in different part of the room (for instance heating panels) and for centralized regulation of a whole family house. 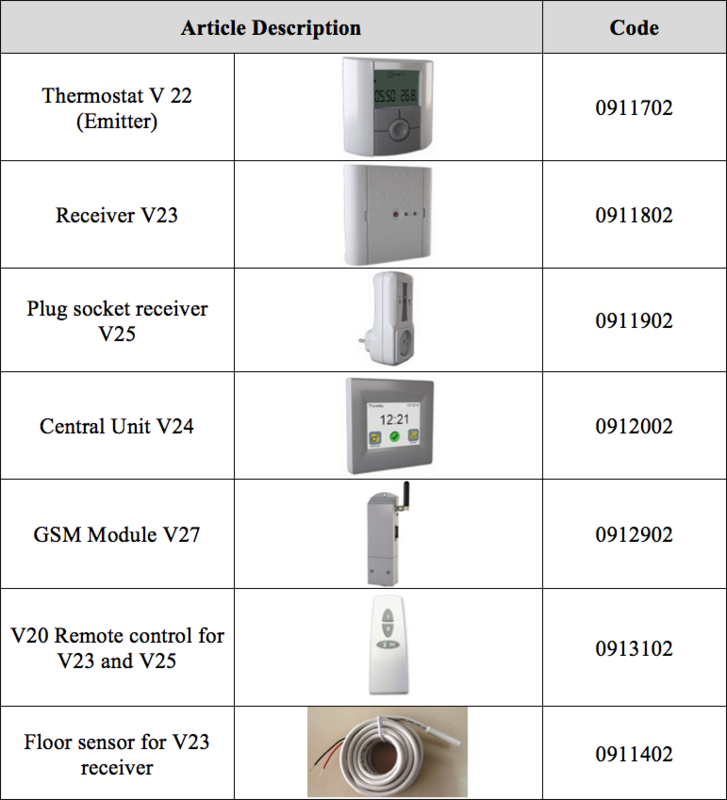 The wireless regulation system provides the possibility to distance control the heating system, either by WiFi (V24 WiFi Central Unit), either by GSM (V24 Central Unit + GSM Module). Add new regulated spaces to central regulation. 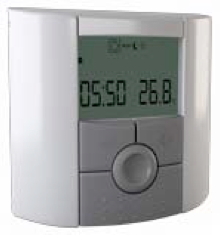 Wireless room thermostat with 1-week programming intended for the control of electric heating through the receiver V23 and V25 (Up to 4 units per V22) with bidirectional Wireless communication. Placement on wall or independently on a stand. 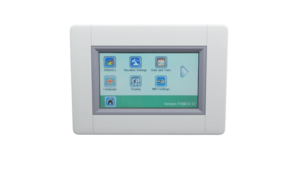 Thermostat designed additionally for a Wireless central regulation with the V24 control unit. Wireless receiver with optional floor probe connection, normally controlled by the V22 thermostat. Placement in a KU68 wiring box, 16 A switching contact. 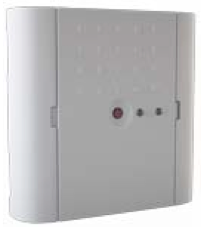 Wireless plug socket receiver for appliances that are fitted with a plug (heating ladder, portable heaters, etc…), controlled with V22 thermostat, or when connected to a central regulation system, controlled directly by V24 control unit. 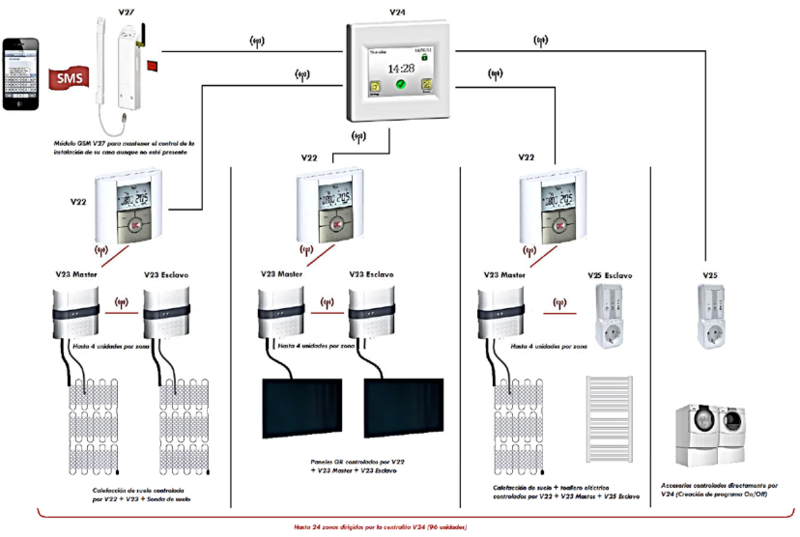 Central unit that allows to control and program the heating system for a whole house through the emitters and receivers (V22/V23/V25) of each room (up to 24 different zones) by radiofrequency. 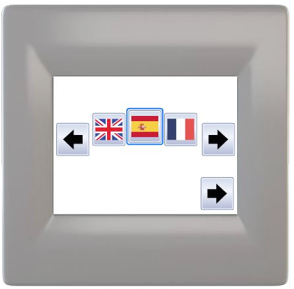 With touch screen display and a plain and intuitive graphical interface. Connected directly to the WiFi network to get remote control of the heating system from any device connected to Internet. GSM module that enables basic control of the whole central regulation system when connected to V24 central unit (Status of individual zones, temperature control, set up changes, mode changes, possible error reports) through smartphone App for Android and iOS , or SMS messages.. The remote control V20 allows through the V23/25 receiver, comfortable hand turning on and off an appliance.